The Lemonheads - or to be more precise, Evan Dando, Bill Stevenson and Karl Alvarez - are playing a show at Club Congress Dec 5th. I'm sure they will play a quick version or two of Lemonheads classics, but we all know going in to this show with the wrong expectations could be a big mistake. Dando's not a summer chicken anymore, as enticing as that sound was. That's why I wanted to post the lyrics to my favorite Evan Dando song. It's not about living like a rock star. It's about growing up, living like yourself, and having that be even better. POSTDATA: Thanks to Danite21 I have posted 18 seconds of footage from the show above. This show was one of the weirdest I've ever been to. There were about thirty of us there. The Lemonheads didn't go on until midnight and by then I was so cracked out tired that I thought I was hallucinating. For a while it was mostly Dando just playing songs on his own, as if we were all hanging out in his dark and cold living room. (It would've been better with overstuffed sofas, but then I really would've fallen asleep.) It was intimate all right, and Dando gave off good vibes, like we could've hung out after the show if I hadn't been ready to collapse. But I guess the whole experience kind of burst my bubble. I thought everyone was as big a Lemonheads fan - but still, how much can you ask for on a Wednesday in Tucson at midnight? conundrum: jose saavedra plays the same night at plush(for free). hardrive is one of my favorites and not just because it features members of calexico and howe gelb. i like the pairing of the somewhat melancholy music with the somewhat life affirming lyric. 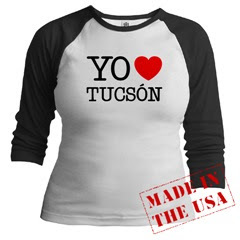 I do need to start blogging before www.tucsonscenester.com is taken! Maybe I'll see you at the great cover up.